Recorded on July 30, 2009 at the Wacken Open Air festival. This is one of those albums that has so many titles, it makes you wonder what the real name of the album is. Neon Nights for sure, but anything after that appears to be up for grabs. It becomes even more confusing when you consider the sub-subtitle (“sub-subtitle”?) of Live In Europe is replaced with Live At Wacken for the European release. If Dio was alive today, I suppose you’d be hearing a number of groans about yet another live album from these guys. 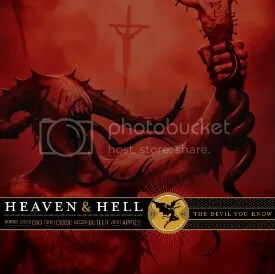 This is the third live album they’ve released either as Black Sabbath or Heaven & Hell since 2007 (and fourth total), but given that the great Ronnie James is no longer with us and this album stands to document what came to be the band’s final tour, I think most Dio fans will give this album a warm embrace. It holds a lot of sentimental value for fans I think and Neon Nights does well to hold up the legacy this group started in 1980. Right up to (and during!) the discovery of cancer, Ronnie was a phenomenal vocalist. For the most part on this album, he sounds just like he always has though with age his voice has gotten a bit gruffer. He’s was still sounding great, still hitting the notes and singing better than almost anyone else around though. Tony is playing great as well. For a guy that never seems to move around much on stage, it’s amazing to hear how fast he can fire off the notes. Even Geezer gets to stretch his fingers during “Heaven and Hell”. That almost makes me wish I did have the DVD, I’ve always enjoyed watching him play bass. If you’re a big Dio fan, you’re probably going to get this disc no matter what. We all know what to expect from these guys in the studio and on stage and this is good album to close out the chapter of Heaven & Hell. They don’t put on bad shows and they get to show off just how good they can be on the epic 17 minute plus version of “Heaven and Hell”. You just can’t go wrong with these guys in concert. A DVD version of this show was released simultaneously and features “E5150” and also “Country Girl”. Would’ve been nice to have those two extra tracks and the DVD was only $1 more than the CD but I just don’t have much use for live DVDs compared to CDs. Dio-fronted Black Sabbath is back! Okay, not technically, but we know it’s true. When Ronnie James Dio reunited with Iommi, Butler and Appice (once again replacing Bill Ward who once again opted out) to record 3 new songs for the Black Sabbath: The Dio Years compilation and then go tour, I think most people knew (even if the band says they didn’t know) it was only a matter of time before a full new album came from this group. It’s hard to believe in 2009, they’ve delivered classic heavy metal album that sounds like it just as easily could’ve been released in 1983. “Bible Black” is a great Dio Sabbath tune and my favorite on the record, but the band delivers with the gloomy, plodding heavy metal they are known for all. “Eating the Cannibals” is really started to grow on me, it’s one of the few songs on the album that is a fast-rocker through and through, which I’m actually a bit disappointed we didn’t get more of. Due to the plodding nature of the album, I didn’t immediately take to some of the songs, but as I keep listening, I’m enjoying them more and more. Definitely a top release for 2009. Of course, Ronnie’s voice is still great. The guy hasn’t stopped releasing music with one band or another since 1958 (!!!) and at 66 years old, his voice is showing no sign of weakness.